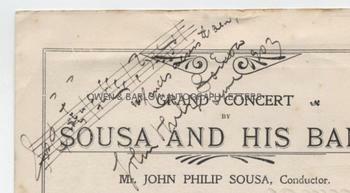 JOHN PHILIP SOUSA Autograph Musical Quotation SIGNED. American composer and conductor, best known for his marches, such as 'Liberty Bell' and 'The Washington Post'. Known as 'The March King'. He was also the inventor of the sousaphone. Autograph musical quotation 3 bars from "Hands Accross the Sea", signed with full name and with title and date June 1903 in his hand. 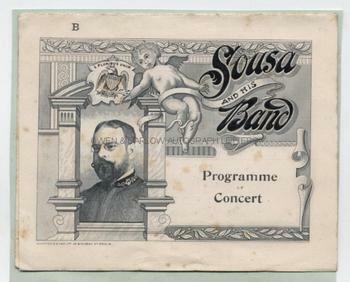 The quotation is on the head of a programme for a "Grand Concert - Sousa and his Band". On folded card (approx 10 x 6 inches) with engraved and embossed front with an engraved portrait of John Philip Sousa and with ornate architectural decorations, swags and cupid. The card opens to reveal printed details of the concert programme. Laid down by blank side of verso onto an album leaf which still allows for the opening of the card. Some foxing spots. VG. The programme of music was a varied mix of classical and light musical pieces, including Haydn and Mendelssohn and concluded with "plantation songs and dances". 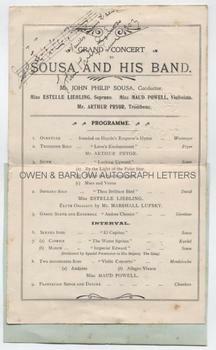 John Philip Sousa was the conductor and also appearing on the bill were Miss Estelle Liebling (soprano), Miss Maud Powell (violin) and Mr. Arthur Pryor (trombone). The concert was given as part of Sousa's tour of Europe in 1903-04.